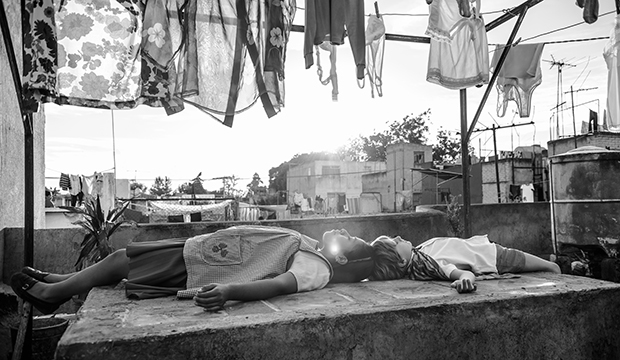 The modus operandi of “Roma” is, as it generally is with director Alfonso Cuarón, ravishing images recounted in long takes. You see this straight away as the title cards slowly unspool over a close-up of a floor tile in the movie’s monochrome being inundated by soapy water before gradually a reflection of the sky reveals itself amidst the suds, planes flying high above. 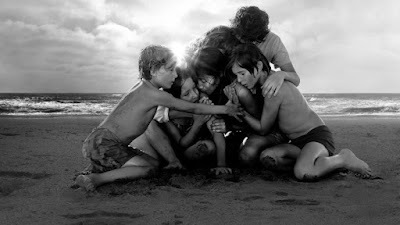 This reflection foretells “Roma” as a reflection of Cuarón’s own childhood even as this symbiosis between something as prosaic as the freaking floor and as dreamy as the sky simultaneously evokes how the images frequently merge the background and foreground, demonstrating how our individual stories are always linked with the world around us. And that immersion with the surrounding world is furthered by the sound design, heard in this scene too, forgoing a traditional musical score, as the whole film does, for the water’s gentle lapping across the tile, intrinsically asking us, the audience, to settle down and focus, perhaps, but also illustrating how the characters in the film are seeking peace within amidst so much cacophony. Eventually, the camera tilts up to find Cleo (Yalitza Aparicio), maid to a sprawling family in Mexico City’s Colonia Roma neighborhood, mopping up a floor covered in dog feces. It instantly places us on her level. This is crucial. “Roma” might be positively Proustian, with this washing of tiles as the entry point to Cuarón’s childhood, the onscreen home a careful reconstruction of his own, the family approximating his, though the movie is not just a flash, like the confit byaldi momentarily transporting the egotistical restaurant critic in “Ratatouille” back, but, as the aforementioned overriding aesthetic implies, immersive. Though the film and consequently Cleo are seen through the eyes of Cuarón, “Roma” is not a looking back, rediscovering, reckoning, realizing that, hey, this woman really was human all along. No, Cuarón is showing us as he saw her, part of the family but not necessarily of it, as a scene where she watches television with the family only to then be dispatched by mother Sofia (Marina de Tavira) to fetch father Antonio’s (Fernando Grediaga) tea, demonstrates. And even if Cuarón elucidating through visuals limits the revelations of Cleo’s inner thoughts, the delicate performance of Aparicio hints at those anyway. When the family arrives at an Uncle’s hacienda for Christmas, Cleo notices the stuffed heads of family dogs on the wall, one of whom, she is told, was likely poisoned by villagers upset with the Uncle’s handling of their land. Though Cuarón punctuates the moment with the latest family dog licking Cleo’s hand, he gives space in the moments just before to show her looking up at the mounted heads, Aparicio’s expression seeming to consider the effect of revolutionary ideals even as that expression’s solemnity acknowledges her personal duties come first. Cuarón’s principal concern is not traditional narrative structure, despite threads suggesting one, but space, both within the home, where so much of the action takes place, and outside of it, and how Cleo fits into and moves through it. Upon discovering she is pregnant, Cleo, yearning to tell her employer, first brings Sofia coffee before being dispatched out into the rain to summon the kids and then, finally, confessing the news, all relayed in an unbroken take, the camera panning with Cleo and then tilting one way and back again, that connects the idea of sense of self coming second. When Cleo’s boyfriend Fermín (Jorge Antonio Guerrero) leaves her in a movie theater after she admits to missing her period, nary a word is spoken, as he gets up from his seat, ostensibly to use the bathroom, and never returns, forcing her to suffer a private emotional breakdown in public, first inside the theater and then outside of it, so much ordinary life indifferently transpiring all around her. These wide frames and long takes might be epic but they are never aloof, extracting astonishing intimacy, virtual paintings affording each viewer the time to pick through each element and eventually focus on the emotions of an individual. In contrast, Cuarón’s occasional close-ups are deliberately devoid of such intimacy. Antonio’s introduction, navigating the narrow contours of his family’s garage as he attempts to park his giant Ford Galaxie, is a series of quick cuts never quite allowing the patriarch to come into full view, suggesting his eventual abandonment of wife and kids. Indeed, when he leaves the next morning, nominally on a business trip, the way de Tavira has Sofia hold onto him, evinces his forthcoming abandonment too. Throughout this nigh frightening embrace, a marching band can be heard in the distance, and as Antonio drives away, the marching band parades right through Sofia as she watches her spouse go, her melancholy juxtaposed against their joy, a shot spiritually linking her and Cleo more than any explicative line of dialogue. If this shot links Cleo and Sofia, there is a later shot, another exquisite long take, linking Cleo with us. It occurs on a beach where Cleo has been left in charge of the children. Though she cannot swim, when a crisis emerges involving a couple of the kids, she wades into and then pushes through the waves, a remarkable feat of cinematic veracity. If so many of Cuarón’s frames revel in depth of field, this one is slightly different, putting the camera to the side of Cleo and watching her move forward so that we cannot see what is ahead. Here, we are side by side with her. And when the moment culminates in the shot giving the movie its poster, which blunts none of its impact, she is one with the family, which is where, we realize, “Roma” has been headed all along, this familial embrace. The noise of the ocean continues roaring in the background, though here Cleo and the kids, momentarily, all piled on top of one another, have found peace in each other.